The first settlers in America were British. They were on a ship called the Mayflower, and they anchored in New Plymouth, which is currently in the Provincetown Harbor located near Cape Cod, Massachusetts. It would later become the “Massachusetts Bay Colony.” The settlers were originally supposed to go to Virginia, but they were blown off course. Why did they leave England and make their way to the “New World?” That was about the time when England decided to separate from the Catholic Church and created the English Church or the Anglican Church. Some of the first settlers wanted to be free to practice their Christian faith the way they wanted to, and so they left and later on created the Puritan Church. Had they just stayed in England, they would have been forced to comply with the teachings of the English Church, because if they didn’t, they would be persecuted or imprisoned. They were also called “separatists” because they separated from the Church and even the State. Since the settlers did not land in Virginia and in fact they landed outside of the areas claimed by English companies, they decided to create their own colony and “use their own liberty; for none had power to command them.” The first settlers believed themselves to be independent from any government and so they decided to create their own colony. They called the colony “Plymouth,” named after the English port they came from. 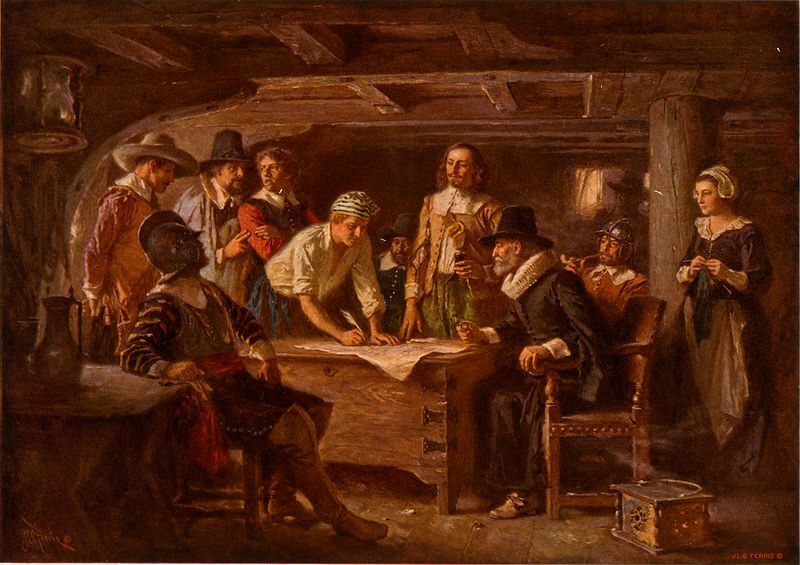 Later on called Pilgrims, 41 adult males out of the 102 settlers decided to create a law, called the Mayflower Compact. They knew that the first group of settlers, those who went to the “New World” before they did, failed because they did not have any system of self-government. In order to ensure their success this time, they decided to create a government, and the Mayflower Compact was the first law ever enacted. According to historians, the foundation of the United States Constitution, which was written more than 150 years after the Mayflower Compact, was this very document.